My new favorite stamp set!!!! Elements of Style from the upcoming Summer Mini Catalog! Designer Printed Album and more!!!! If you haven't gotten your copy, let me know and I will send you one. Ok, so how did I create this vintage card and what products were used? Close to Cocoa paper as the 5-1/4 x 5-1/4 card. 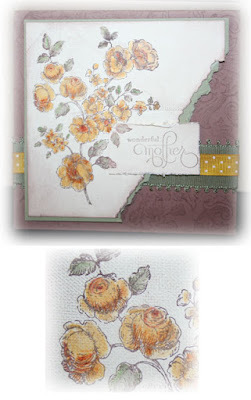 Ink the Bella Toile background stamp with Chocolate Chip ink and stamp on card front. Sponge Crushed Curry ribbon with Chocolate Chip ink. Wrap both sets of ribbon (the green is retired from Theatre Originals but on the Clearance Rack!!!!) around the card front and color in the front (since it will get covered by the focal panel). Use a 4-3/4 square of Mellow Moss and 4-1/2 square of Very Vanilla. Stamp Rose image with Chocolate Chip on Very Vanilla paper. Then stamp with Chocolate Chip using the retired Linen background stamp (several times in several different directions). Sponge all edges of Very Vanilla paper. Then with the Very Vanilla, tear the bottom, right edge with Tearing Tool. Place on the Mellow Moss paper, and then tear that paper as well (see image above for guidance). Stamp a greeting in Chocolate Chip and then roughen the edges using the Distressor tool. Sponge edges and adhere using Stampin' Dimensionals. NOTE: Keep in mind MELLOW MOSS and CLOSE to COCOA are RETIRING!! !